India conducted its second nuclear test on May, 1998. 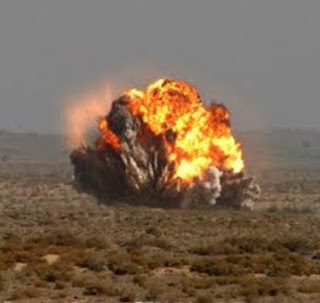 Referred as Pokhran II, the country tested its five nuclear devices, three on May 11, 1998 and two on May 13, 1998. The tests resulted in a variety of reactions from within the country and from abroad, and also invited sanctions against the country by some major states. On May 18, 1974 India conducted its first nuclear device, code named Smiling Buddha, declaring itself as a nuclear power. The bitter defeat in the 1962 Sino-Indian war, where India lost a part of its territory in Kashmir (Aksai Chin) to Pakistan, triggered the development of such system in India. Pakistan then gifted a part of its occupied Kashmir to China. China and Pakistan are hence connected and have built a highway which China uses to deploy its navy in Arabian sea, close to India. It underscored the need to have a strong military with a comprehensive capability to deter enemy forces. In 1964 China tested its nuclear device at Lop Nur. After this, India kick started its nuclear program. Bhabha Atomic Research Centre started developing bomb grade plutonium and other bomb components. The project was stopped after the death of Pt. Jawaharlal Nehru, but was resumed during the period of Indira Ghandi in 1968. In 1995, further needs of testing the bomb aroused. P.V Narsimha Rao, then prime minister, decided to carry out the tests, but the movement were detected by American spy satellites and soon the pressure was put on India to stop the testing. Now the task was to test nuclear bomb without letting anyone know. On 11 May 1998, under the leadership of Atal Bihari Vajpayee, India carried its second nuclear device test. The detection of preparation of such test in 1995 by American satellites alerted Indian scientists and, this time, extensive measures were taken in order to deceive intelligence agencies around the world. The decision to test was not disclosed even to senior cabinet ministers. The preparations were managed by a closed group of scientists, military officers and politicians. Much of the work was done at night. The equipments were always returned to the same spot at the onset of dawn to deceive American satellites that the equipments never moved. Piles of dug-out sand were shaped to mimic the wind shaped dune forms in the desert area. The shafts were dug under camouflage netting. When cables for sensors were laid they were carefully covered with sand, and native vegetation was replaced to conceal the digging. India adopted a policy of ambiguity. Statements by Indian diplomats gave an impression to the world that India has not yet decided its future nuclear plans.